It’s been dark and dreary all week with clouds and rain so I wasn’t able to take pictures of my top-down-circular-yoke sweater. At least all the snow has melted from last week! The colors are so close in tone that they almost blend together. It’s very difficult to tell them apart while knitting particularly under incandescent lights. I decided to go with a two-row stripe and since I have one more ball of the mallard (green) color, I began with it and will use it as the button band color. The increase rows are distracting to me but that’s the nature of this beast. Hopefully blocking will even out those stitches so they are less noticeable. The wrong side. 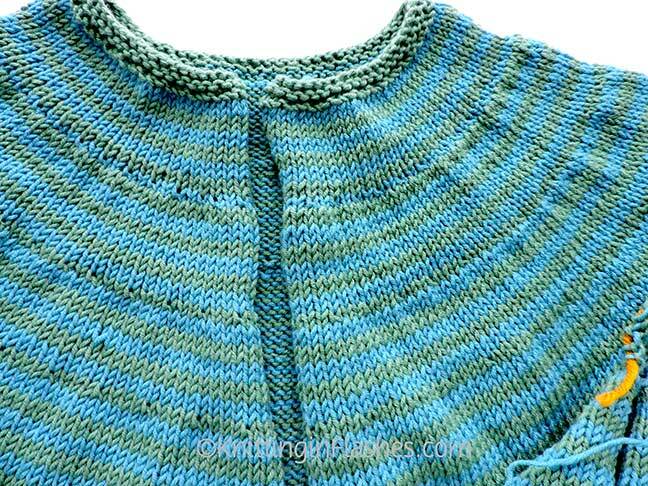 The neck edge is just four rows of garter stitch. I was thinking of making a picot hem for the sweater but keep the garter stitch at the sleeve hem. Just not sure. Would two different hem edges look dumb? 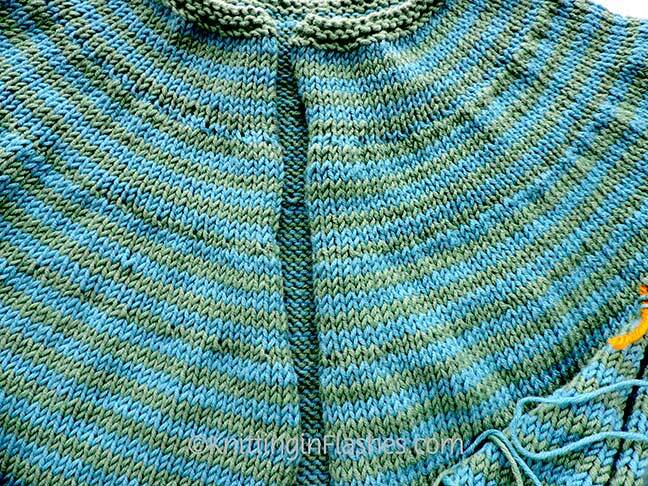 This entry was posted in february baby sweater, knit, knitting, knitting pattern, sweater, yarn and tagged February Baby Sweater, knit, knitting, pattern, sweater, yarn by Patti_is_knittinginflashes. Bookmark the permalink. Wow, you are making great progress! Interesting how the colors are reading. I often do a slightly different sweater and sleeve hem. I like my bottom band loose and my sleeves snug. So go for it, I think it will look fine. I like the idea of the different hem. 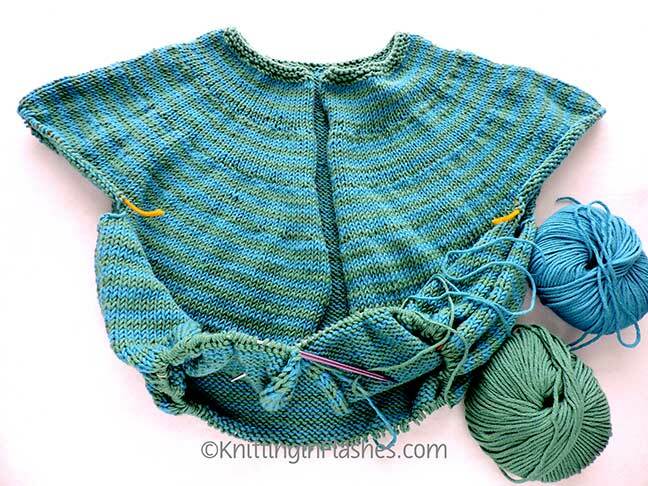 Are knit picots as much a pain as crochet? Not a pain but they do use more yarn. I know so very little about crochet that I can’t compare the two.